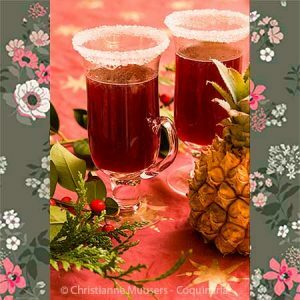 The recipe on this page is a historical version of the Feuerzangenbowle that can also be found on Coquinaria. Both are for hot, mulled wine that is sweetened by a sugar cone which is drenched in rum and set alight above the punch bowl. I was looking for a historical version of the Feuerzangenbowle, because it is purported to have nineteenth-century roots. However, I could not find a recipe with the same name. Below is the other recipe I found, a punch. The preparation is the same, but there are also some differences. In this recipe red and white wines are used, and Sekt. Spices are not used at all, but pineapple juice is added. The recipe, called Polnische Königspunsch (Royal punch from Poland), can be found in a later version of the Praktisches Kochbuch (Practical Cookbook) from Henriette Davidis (1801-1876). This very successful cookbook was first published in 1844, and saw many reprints, even after de demise of the author in 1876. Then the cookbook was revised by Luise Rosendorf (1821-1890). The recipe for the punch is not present in the editions that appeared during Davidis’ lifetime, and neither in the revised editions from Rosendorf. It was first published in the second revision by Luise Holle (1864-1936), made after Rosendorf died in 1890. This was the 32nd edition of the Praktisches Kochbuch. When writing about this cookbook, please keep in mind that three generations of women have contributed to it, and let the reader know which version or edition is being used. The Dutch translation was published in 1867 (with a reprint in 1868), so that was made during Davidis’ lifetime. There are two recipes from the Dutch edition on Coquinaria: Capon with caper sauce and Soup with garden herbs and potato dumplings. Why is this punch called royal and Polish? To be honest, I am not very well versed in the history of Poland. I have looked at the English and German versions of Wikipedia, and – with thanks to google translate – also at the Polish Wikipedia. In short: yes, Poland had kings, but it was also at times a republic, and from 1795 until 1918 the country was divided between Russia, Prussia and Austria. 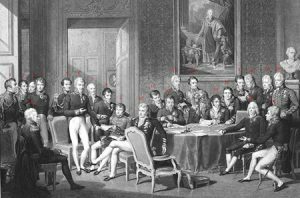 This division was consolidated during the Congress of Vienna. At the conclusion of the First World War Poland was unified again and became an independent nation once more, a republic. This republic was short-lived, in 1939 Poland was divided once more between Germany and Russia. The czars were called king in the part of Poland that was annexed by Russia in the nineteenth century (Congres Poland). But whether this punch has been named after a specific king is doubtful. Probably it is the same as with the Dutch queen’s soup, a dish that was very popular during our century of successive queens but has no relation to a particular queen. I must confess that I do not have any knowledge of Slavic languages. So, I cannot read any Polish cookbooks to look for punch recipes. I did find an English cookbook on Polish cuisine (see bibliography) that had a recipe for Sylvester Punch (poncz Sylwestrowy). However, that is a very basic recipe, in which an orange and lemon are rubbed on sugar cubes which are then added to red or white wine with rum. No pineapple anywhere. My preliminary conclusion is: the Polish drink punch (there is even a recipe for Cucumber Punch in the cookbook! ), and they have had kings in the past, but these two facts are not connected. If there are any Polish-speaking people who know of a Polish source of the historical recipe on this page, I would be delighted to hear from them. This punch from Poland caught my interest not only because of the burning of sugar for which I was searching a historical recipe, but also because of the pineapple juice. The pineapple originates from the tropical rainforests in an area that now comprises Brazil and Paraguay. The English name pineapple comes from the resemblance of the fruit to the ‘apples’ from pines. Originally, the Dutch also called it a pijnappel, but eventually the original Indian name won and now we refer to the pineapple as ‘ananas’. This is derived from anãnã from the language of the Tupí-Guaraní. The South-American Tupí-Guaraní domesticated the plant; they used the fruit uncooked, or as jam (jelly), and to produce alcohol. By the end of the fifteenth century the pineapple was also cultivated outside of its area of origin: Columbus saw his first pineapples during his second journey, on the island Guadeloupe (as he named it). Europeans compared the plant to aloe vera or artichokes, the shape of the fruit with large pineapples, and the fruit itself tasted like melons. Columbus took six pineapples with him on the return journey to Spain in 1494. 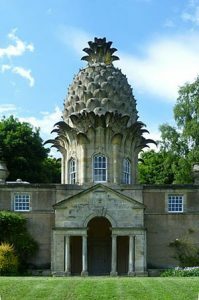 Five of them had rotten during the trip, the surviving pineapple was presented by Columbus to king Ferdinand II and queen Isabella of Aragon and Castile. The king considered the pineapple the most delicious fruit of all he had ever tasted. Pineapples were also appreciated by royalty because of its crown of leaves. Growing mature, edible pineapples proved to be a challenge in Europe. The greenhouse in which the pineapple resides during the winter does not only needs to let in plenty of daylight, but also be heated constantly. 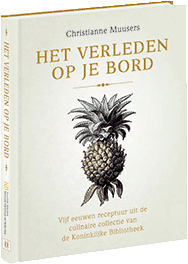 The first to succeed in growing a mature, edible pineapple fruit was Agnes Block, in her greenhouse at her buitenplaats De Vijverhof along the river de Vecht. But more than for its taste, the pineapple was appreciated for its shape and exclusivity. Pineapple shapes were used as architectural ornament, on decorative wallpaper, and as a conversation-piece on the dining table. Such a ‘table-pineapple’ was used several times, until it began to decay. A solution to the decay of pineapples during transportation from the Caribbean was to harvest them while still green. The fruit would mature during the trip. But these unripe-harvested pineapples tasted inferior to those that had matured fully on the plant. At the time of the recipe for the royal punch from Poland (1890), pineapples were still a sign of luxury, hence the royal punch. However, in the recipe for ‘Ananas-Bowle’ (pineapple punch) from the same cookbook, canned pineapple can be used instead of fresh fruit, and the juice from the tin can be added to punch. 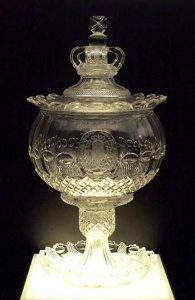 That recipe dates from the first revision by Rosendorf in 1881, in the original cookbook of Henriette Davidis the pineapple bowl is not present. Rosendorf informs the reader that canned pineapple is imported from Havana. By the way, I too have succumbed to the alluring pineapple. The front cover of my cookbook with recipes from the culinary collection of the Royal Library, Het verleden op je bord (The past on a plate) shows an illustration of a pineapple from Meyers Konservations-Lexikon (1888-1892). So, I had to include a recipe with pineapple but that was difficult to find because I was not allowed to use books that were published later than 1870. But I found one! On the brink of the period, because the cookbook with a recipe for pineapple ice cream is from 1869. This recipe is from the 1896 edition of the Praktisches Kochbuch (35th edition, p.640). It can be found in the chapter “Allerlei Getränke” (all kinds of drink), which opens with coffee and tea. Man reibt an 500 g Zucker eine halbe Apfelsine und eine halbe Citrone ab, kocht dies mit 3/4 l Wasser zu dünnem Zuckersirup, fügt den Saft zweier Apfelsinen und einer halben Citrone, 3 Löffel eingekochten Ananassaft, 1/2 Flasche Rheinwein, ebensoviel Chablis und Burgunder hinzu und läßt, ohne das es kochen darf, heiß werden. Dann taucht mann ein stück Zucker in Rum, legt es in einen silbernen Löffel, hält den Löffel über den Punsch und Zündet den Zucker mit einem Fidibus an. Sowie der Zucker brennt, gießt man immer neuen Rum auf den Zucker, bis man eine halbe Flasche so brennend in den Punsch hat laufen lassen, dann gießt man eine halbe Flasche Schaumwein an und reicht den Punsch sofort. Anmerkung. Der richtige Punschkenner brennt den Rum, welcher natürlich bester Sorte sein muß, stets auf oben angegebene Weise ab. — Zur Mischung mit Weißwein und Fruchtsäften ziehe ich roten Rheinwein den französischen Rotwein vor und empfehle beste rote Fruchtweie als billigen Erzatz der roten Rheinweine. Rub a half orange and a lemon on [a] sugar[cone] from 500 gram, and cook this sugar with ¾ litre water to a thin syrup. Add the juice of two oranges and a half lemon, and 3 spoons reduced pineapple juice, ½ fles Rhine wine, as much Chablis and Burgundy wine. Heat this without boiling. Then dip a piece of sugar in rum and put it in a silver spoon. Hold the spoon over the punch and light it with a fidibus (= a strip of paper used to light something, especially a cigar). Keep pouring fresh rum over the sugar while it burns, until about half a bottle has been poured, burning, into the punch. Finish the punch by adding a half bottle of sparkling wine and serve at once. The true punch-expert always burns the rum – that should be of the highest quality – in the manner described above. I prefer red Rhine wine to French red wine for tempering with white wine and fruit juices, and my advice is to use red fruit wine as a cheap alternative to red Rhine wine. The original recipe does not have a separate list of ingredients, and that makes it hard to understand it. For example: what is meant by the remark on red fruit wine? The author suggests using it as replacement for red Rhine wine, which is a replacement for red French wine. The Rhine wine is tempered with Chablis, which is a white Burgundy and an unspecified Burgundy. Should that be red or white? Who knows? Holle ends her recipe with the remark that she prefers red Rhine wine above red French wine. So, for my adaptationI have combined Rhine wine and Burgundy and used ‘a red wine’. One can try a full red German Rhine wine, but frankly, any red wine will do. By the way, the wine which is recommended when eating pineapple is a sweet white wine like Sauternes or Spätlese Riesling. Hot alcoholic drink for 12 persons (with portions of dl each); preparation in advance 15 minutes; preparation 15 minutes. Pour boiling water over one orange and the lemon. Dry them and grate the peel. Press both oranges and a half lemon, strain and reserve the juice. Put the pineapple juice in a pan and reduce to half the original amount. Put sugar, water and citrus peel in a pan and bring to the boil. Strain the syrup to remove the orange and lemon peel. Heat the syrup with concentrated pineapple juice, the reserved lemon and orange juices and the red and white wines until hot, but it must not boil. Pour the liquid into a heat-resistant punch boil, or simply place the pan itself on a burner with bio-ethanol. Place the sugar cone in a special fire tong, or use a perforated spoon or strainer that can stand the heat. Drip rum over the sugar until it is saturated. Check that there is nothing near the punch bowl that can catch fire, then light the rum. The sugar will melt and caramelize and drip into the hot wine. When the flames start to disappear, pour extra rum over the sugar. Use a spoon, do not pour straight from the bottle, to prevent the flames jumping into it. When all sugar has melted, pour the Sekt or other sparkling into the punch. Serve it hot, in preheated mugs or heat-resistant glasses. During the nineteenth century punch could be served in small companies, but also in large gatherings such as balls. Because there are at least three different wines in this punch (red, white and Sekt), it is difficult to make less than the amount from the recipe. One will have to use half and quart bottles of wine, but it can be done. In that case, prepare the punch completely, with the burned sugar included. If necessary, reheat the punch before serving. Pour into preheated glasses or mugs and add the Sekt at the last moment. Rum is a fermented and distilled drink made from molasses (sugar cane syrup) or straight from sugar cane juices. Rum is available in several strengths, from 37½% to 80% alcohol. Rum matures in oak barrels after distillation. 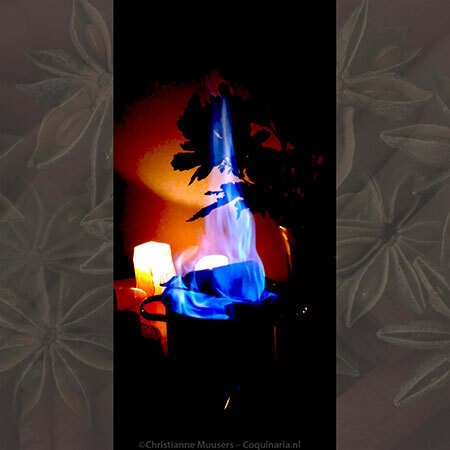 For the Feuerzangenbowle rum with a minimum of 54% alcohol is needed (‘Navy Strength’). Read more about rum on Wikipedia. By the way, from my mother I have learned to prepare rum grog to combat a heavy cold: juice of half a lemon, a royal dash of rum and a spoonful of sugar, topped up with boiling water. Drink it hot. I do not whether it cures the cold, but it is an excellent sleeping potion! This is ‘German Champagne’. According to the German Wikipedia, it was Georg Christian Kessler who first produced sparkling wine in Germany, in 1826. Originally, he worked for the French Champagne House Veuve Cliquot, and he used the acquired knowledge when he returned to his homeland. Naturally, the name Champagne is protected, but a good German Sekt is also very fine. Duane Bartholomew, Richard Hawkins and John Lopez, ‘Hawaii pineapple: The rise and fall of an industry’, in HortScience (October 2012, vol. 47), available online. Francesca Beauman, The pineapple: King of Fruits. 2005. 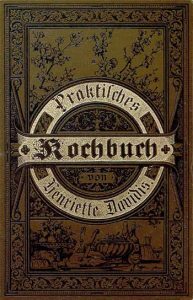 Henriette Davidis, Luise Holle, Praktisches Kochbuch, 36st edition (1896). Marja Ochorowicz-Monatowa, Polish Cookery: Poland’s Bestselling Cookbook Adapted for American Kitchens. 1968. This punch with caramelized sugar is from a German cookbook from the end of the 19th century. 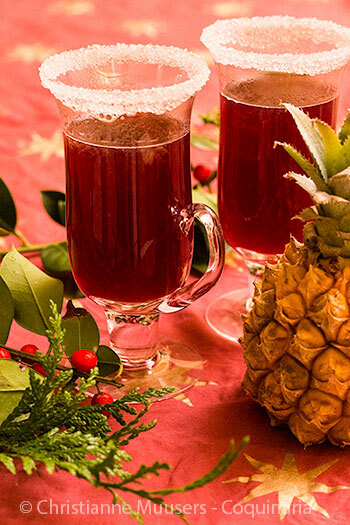 A festive, hot and delicious drink.